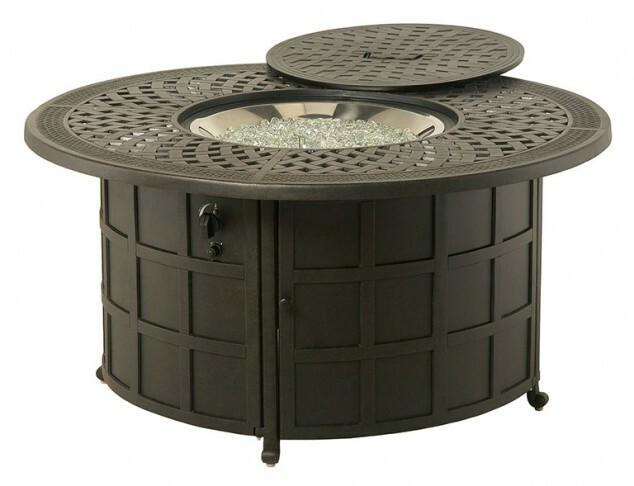 The Berkshire 48" cast aluminum gas fire pit has a simple woven top that accents any setting in which it is used. Its traditional look can enhance any outdoor space and make it the focal point of the space. Durability is a plus with its cast aluminum construction. BTU rating of up to 48,000 BTU's. Fueled with a 20 lb. propane tank, the 48" Berkshire gas fire pit also has the option of a natural gas conversion kit. Place the matching lid over the burner and this gas fire pit doubles as a table. Available in two frame colors: Black and Desert Bronze.